Also, they may actually heighten local tensions. Investments in extracting resources in these areas are welcome, but they take place against a background of considerable marginalisation and violence. Turkana, in northern Kenya, where oil exploration operations have mushroomed since 2012, is a prime example where relations between the state and local communities have descended into mistrust and conflict. Turkana is Kenya’s poorest county. Until the oil finds, successive governments showed little interest in Turkana, even though insecurity was rife and poverty levels were high. Many Turkana are dubious of the state’s inability or unwillingness to address chronic violent insecurity, which has been so damaging to the livelihoods of local pastoralists over time. In this interview, I talk to Celeste Hicks, a former BBC journalist and author of Africa’s New Oil: Power, Pipelines and Future Fortunes, on her insights into the impacts and outcomes of oil finds for Africa’s rural communities. What are the impacts of frontier oil exploration and extractive operations? Is there any evidence that people’s lives have transformed for the better? We see the impacts of oil extraction projects in neglected regions of southern Chad and eastern Niger, most notably in infrastructure. In Chad, which was the subject of an innovative project supported by the World Bank to try to ensure that oil revenues would be used to fund development projects, the road leading from the Chadian capital N’Djamena to Moundou and Sarh in the south, close to the oil fields, has been completely upgraded in the last decade. Localised power generation has improved and aircraft landing strips constructed. However, I believe it would be too optimistic to claim that these areas have been “transformed”. Communities remain very poor and genuine sustainable growth – that is, job creation – has not occurred. What are the risks of establishing new oil operations in areas that have a legacy of state neglect? In the worst case it could be expected that badly managed oil production in marginalised areas could lead to a Niger Delta scenario of heightened violence. My research in Chad, Niger and Ghana suggests that these oil projects are creating nothing like the kind of environmental destruction, political tension and social exclusion seen in the Delta. I actually came to a cautiously optimistic conclusion that a lot has been learnt from this experience. Oil companies and African governments alike are keen – at least in theory – to avoid it happening again. What have been the experiences of communities near the oil finds? In reality very little has changed for most ordinary people. In the early days, the World Bank-supported project helped to guarantee generous compensation rates for land and property acquisitions in Chad’s Doba region, and aimed for 5% of oil revenues to be ploughed back into local development as a further “compensation” for the expected disruption. A number of important civil society groups, including the Alternative Research and Monitoring Project on Oil and the Catholic Church, continue to carry out research and campaigning activities on oil. 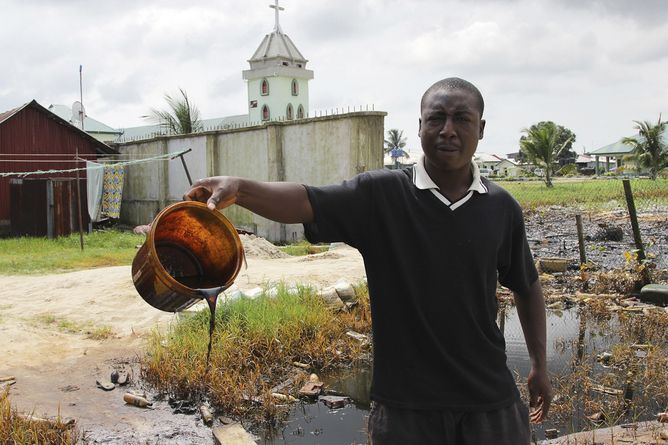 But 12 years on from the start of the project, many people in Doba feel disappointed about the long-term impact of oil. Many of those lucky enough to get stable jobs in the industry are well-qualified graduates from the capital. Oil companies, including the consortium which runs the Kome fields – Esso, Petronas and now the national oil company SHT after Chevron pulled out last year – tend to source very little in terms of food, fuel and services from the local market. There have been claims that oil can create jobs and spur local economic development, but some argue that oil is capital intensive and doesn’t create jobs. What have you found? This area of “local content” is very important for the five African countries I profiled in the book. All of them want to increase local participation, both through direct job creation in the industry and through sourcing of services such as drilling, construction and catering through local companies. The lack of skills of the local workforce appears to be a serious impediment to offering more employment opportunities. It can often seem that there is an unquestioning acceptance that local people should be employed. Tullow Oil in Uganda – of which 88% of its 200-strong workforce is local – contends that labour restrictions can be seen as trade barriers. But in some ways the debate is already moving on. In Kenya I met civil society activists who argue that the real challenge today is to protect livelihoods which already exist rather than focusing solely on job creation. In Turkana’s case this is pastoralism and fishing in the lake. This comes through a recognition that oil is a finite resource and that production may only last 20-30 years. How can oil operations be established and managed in a conflict-sensitive way? There is no one-size-fits-all answer to this question. It is essential that there should be an informed public debate about what communities and the nation want to achieve through oil production. Frameworks and laws have to be put in place to protect those whose lands and livelihoods are affected and to ensure that oil revenues can be clearly traced and put back into national development. The priorities for spending towards development should be agreed nationally. Transparency in a government’s dealings with an oil company is vital in order that communities can see and challenge what has been agreed. But more fundamentally, the biggest challenge in all the countries I highlighted within my book remains good governance. Well-written laws need democratic accountability and political will to back them up. Unfortunately in Niger, Chad and Ghana, when challenging political circumstances occur, many laudable commitments have been reneged upon. Jeremy Lind is leading a study on the impacts of oil development in Turkana, Kenya. This piece was first published by The Conversation.